There is an infamous Catch-22 in starting a career in information and communications for technology. In order to earn a job in ICT4D, I need to have experience. In order to gain experience in ICT4D, I need to earn a job. So many job seekers find themselves discouraged from being stuck in this infinite loop. There is hope! For practitioners willing to put extra effort into the career pursuit, don’t sit idly by waiting for job interviews. Create your own job by taking on independent projects using ICT to address a problem in developing countries. Doing so gives an individual experience working through issues in the context of the developing world and proves to employers that an individual possesses the initiative and skills to make a project sustainable. This is not an easy undertaking. It requires proper research, planning, and a thorough understanding of the resources that will be needed. Half-completed or poorly planned projects will do nothing for attractiveness as a potential employee. If you’re not up to this challenge, stop reading now. This post is not for you. If you feel confident in your ability to step up to this challenge, there are some things you should consider. These are points that I have picked up from my own experience developing an independent project, coupled with tips from professional practitioners. 1) Problems come before solutions…ALWAYS. Developing a solution and then trying to apply it somewhere in the developing world is backwards thinking. It does not address real needs. You should never go into an ICT4D project assuming that a certain tool or expertise is going to be applicable within a community. First, investigate areas that could benefit from technology, and then choose the most appropriate project design and tools. 2) There’s a not-so-fine line between thinking big and thinking gargantuan. While it’s great to take risks and create challenging projects, designing a solution with an unmanageable scope is only doing you a disservice. Start with identifying a single problem within a single institution within a single community. Work with that community to develop a solution. At the same time, consider how the technology can be developed in a way that is scalable or transferable. This way, if you find later that a similar problem exists in another community, it will be easier to modify it to meet more needs. 3) ICT4D professionals love to talk about their work…and they have a lot more experience than you do. All ICT4D practitioners love to talk about their work with those who are genuinely interested. Find people who have done work in the realm of your project via Twitter or Google+, and then ask them if you can conduct an informational interview. This will give you the opportunity to pick their brains on best practices, while indirectly making your work and interests known to others in the field. Anyone you talk to will likely gain a vested interest in how your project turns out. 4) In ICT4D, failure to learn from a mistake is the greatest failure. Failure is increasingly becoming a less stigmatized word in ICT4D. With events like Fail Faire taking place, everyone in the field has been owning up to their failures in order to promote others learning from past mistakes. Pay attention to all of this on Twitter, blogs, and in conversation with professionals. There is a lot of great advice available and typical errors to avoid within these discussions. 5) It’s no longer Six Clicks to Kevin Bacon. It’s now Two Clicks to Document Heaven. You’re going to find that you need certain documents and resources for researching and developing your projects. 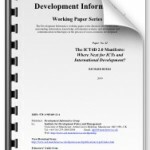 It can sometimes be very difficult to locate these documents, since the digitized versions of paper documents are not always kept up to date on websites within the developing world. With Twitter, it only takes two clicks to track these documents down: one to hit the Tweet button after asking where to find the resource, and one to open the email containing whatever it is that you need. Make use of your Twitter networks when you are unable to find something. Practitioners are usually more than willing to help you out, and it further stimulates interest in your project. 6) Neglected stakeholders represent neglected projects. A lot of people are affected when technology is brought into the developing world. Before designing and implementing a project, every stakeholder should be considered, and the design should be planned with the goal of obtaining support, maximizing benefit, and minimizing obstacles for each. Work with your stakeholders directly to ensure that you are not inaccurately assuming their needs and potential dilemmas. Even if no one reads it while you are working on your project, it is very useful to maintain a blog to document each milestone. This will allow you to iron out thoughts on progress, setbacks, and what you are learning. Afterwards, you can point potential employers to your blog for an overview of everything that you did and what you discovered about working within the developing world. 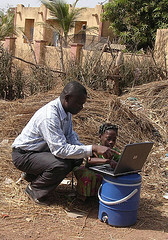 8) Technology is just a teeny, tiny piece of any ICT4D project. In ICT4D, it is never just about creating a technology solution. There are many other factors to consider in order to make projects sustainable. These involve training, developing standards and policies, planning for continued funding, among countless others. Be sure to identify these factors and plan for them. Dumping technology without these considerations makes sustained success very unlikely. 9) Success will not make or break you. The gaining of knowledge will. As mentioned before, the greatest failure in ICT4D is not to learn from a failure. If your project does not turn out to be successful, don’t assume that you’ve lost hope of earning that dream career. Be prepared to point out where your project went wrong and what you learned from it. Ultimately, having the experience working through a problem and solution in the developing world is the most important thing to show potential employers. 10) We’re not in it for the money; we’re in it for the good. While it is great to gain the experience in this field and prove how wonderful you are to employers, it is also important not to forget the truest motives for developing a project. It’s not about you; it’s about who or what you are helping. Once the project is complete, don’t leave it hanging. Be sure to follow-up on it, and offer future help when needed. There is a certain moral integrity that comes with being in this field. Don’t let the pursuit of a job mask that.